The Florida Police Chiefs Association would like to express our deepest condolences to the family and friends of Officer Bryan Durman, and the Lexington-Fayette Urban County P.D. Our thoughts and prayers are with you during this time of great sadness. Please take comfort in knowing that your extended law enforcement family grieves with you. Officer Durman, we thank you for your service. You will not be forgotten. My family would like to send our condolences to the family, friends, and fellow co-workers of P.O. Bryan Durman~you're in our thoughts and prayers during this very difficult time. May God give you the strength to carry on and help heal your hearts. May you find comfort and support with those around you. God bless you and rest in peace, Officer Durman. My thoughts and prayers to the family, friends and co-workers of Officer Durman. Another Hero taken too soon. May God comfort you and your family as you go and touch the face of God. May God lay his healing hand upon the family and friends of Officer Durman and may they know he will never be forgotten. Thank you Officer Durman for your dedicated service to the people of Kentucky and the United States. Thank you for your service. May God grant you eternal peace. May he also grant your family, friends, and co-workers the strength they will need during the rough times ahead. My condelences to the family, fellow officers and friends of Officer Bryan J. Durman. Thank You for your service to the Commonwealth and our Great Nation. Your sacrifice will never be forgotten. Our thoughts and prayers go out to the family and fellow Officers at LMPD. You patrol streets of gold with your brothers and sisters in blue who went before you. You will never be forgotten. May God hold your wife and young son in His loving arms. Our deepest sympathy to the family and friends of Officer Durham. 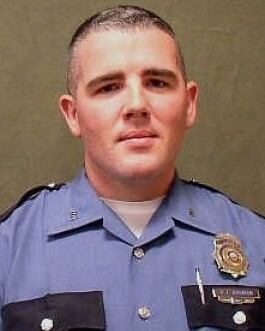 God Bless him for his service to the Lexington-Fayette Urban County Police Department. Rest in Peace sir, you will not be forgotten. You will be greatly missed, but you will never be forgotten. Officer Durman, you wil not be forgotten! R.I.P. God has greeted you with open arms and eternal love on your transfer into His police Department. The service and honor you brought to His children in your community will never be forgotten and those brothers and sisters left behind will tend to your family. Rest in peace brother. In christ. It was an honor to work with you. You will never be forgotten. Rest now Brother we have the watch. Thank you for your service. May God comfort your family, friends, and fellow officers at this time. Rest in peace Officer Durman. "No Lord, I guess I ain't, Because those of us who carry badges can't always be a saint. I've wept an unmanly tear." they never wanted me around,Except to calm their fear. You've done you time in hell." To the family/friends and co-workers of Police Officer Bryan Durman: I would just like you to know that I grieve with you over this tragedy as do thousands of other Police Officers all over the country. The risks are just so great in this line of work and so sudden. I would just like you to know that your loved one bravely took on these risks to protect others and holds a high place of honor in our hearts. Thank you for your sevice and dedication.Bless you and God speed.We now have the watch. God be with Officer Durman's family, his wife and son, as well as the ones that continue to protect our community. I've spoken with Officer Durman numerous times, and he seemed like such a honorable person. Peace be with you Officer Durman, your fellow officers have your watch.